More weeding tonight. 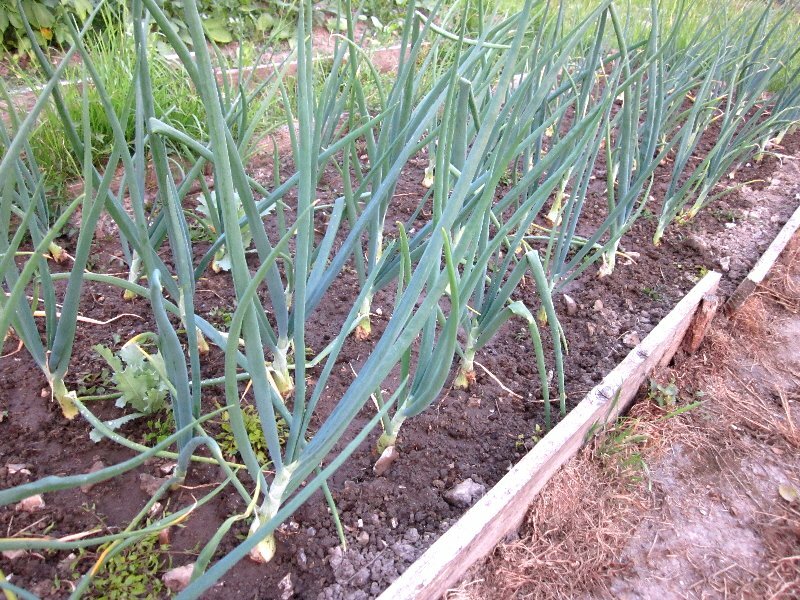 Have cleared all visible weeds (bar two poppies) from the onions. Some of them are now showing signs of being a decent size. Not many though! 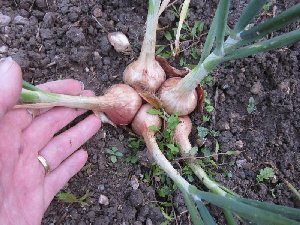 Again the curse of the onions has struck – there are several plots who have used the same sets from the same sale and started them off in pots like I did and are huge. I have no idea why mine don’t grow. Maybe next time I should grow them inside the shed for a while. Gardening lady has been up and started to clear the orchard area, thank goodness. Watered everything well in advance of the forecast heatwave. 30oC by next week? Eeek. Leeklets have been walloped by giant slugs. 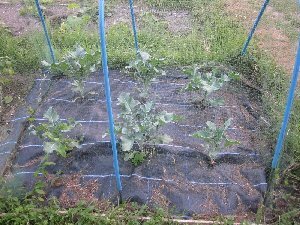 So have several of the minicole cabbages. I extracted about a dozen from the plants, mostly 1.5 – 2+” in size. Huge. Well they won’t munch anything else after meeting my trowel. Hope the cabbs recover! The things that are doing very well are the runner beans (flowering, with some near the top of the canes) and the courgettes which I didn’t think big enough for fruiting yet. But here they are. Leaves of the courgettes are getting to the more mature shape now. Seedling leaves are quite heart-shaped, but the older the plant, the more they acquire quite deep cuts. Heatwave! Had to go up and water or things would have been frying in the >25oC temperatures we now have, and will have for the next week they say. Was just planning on watering everything but couldn’t resist weeding the runner bean bed while I was at it. They are doing very well. 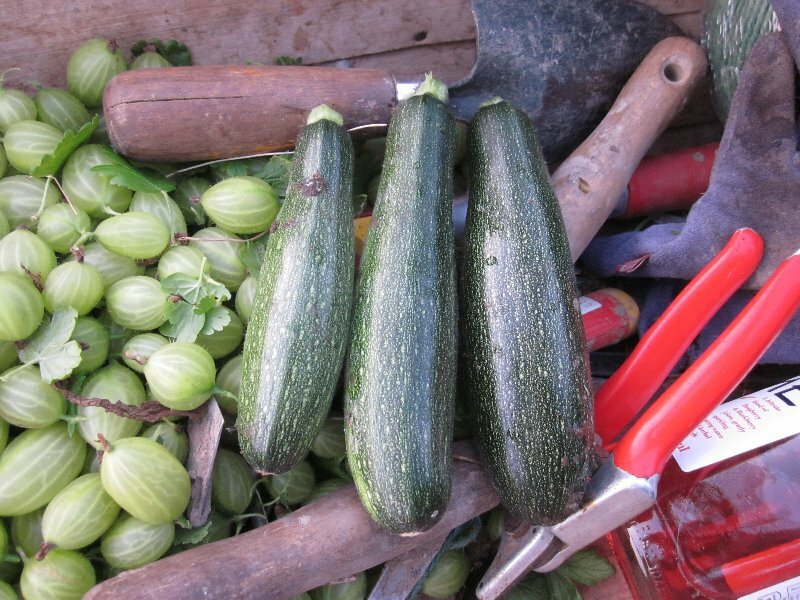 Picked two courgettes! Only about 4” long but I don’t want them too large – I want the plants to do that thing of suddenly getting huge overnight before they crop too much! Also planted the trailing marrow that I’d had in a 6” pot in the shed. It had got to about 18” long and the leaves were indeed turning into the mature shape, so I figured I’d better get it in. Onions getting visibly larger though still small compared with everyone else’s, it seems. I shall keep watering and see what happens. A lot of grass and other weeds have been chopped back in the orchard area by my Gardening Lady: needs digging out still but at least it’s more out of the way. 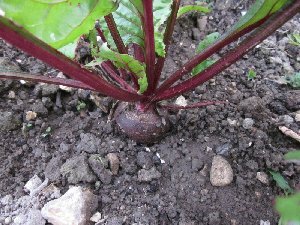 Next up: weeding the potatoes a bit. They are getting rather bindweedy. Still too hot for me. Decided against potato weeding tonight and to pick gooseberries instead, and water everywhere. 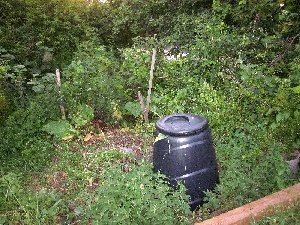 But of course I couldn’t resist trying to clear some bits, and it was the turn of the comfrey to get sorted out a bit. This is the monster clump that resulted from my few little roots that I planted at the back of the plot in June 2003. Luckily it snaps off easily and it got shoved leaf-first into the compost dalek. Munch. All of a sudden I had space – and could reach the rest of the gooseberries. Still have lots of nettles which I’m going to spray later in the week. Picked 3lb 10oz of gooseberries. I already have 2lb 8oz in the freezer so I think we’re going to have some goosegog crumbles in our immediate future. Yum. 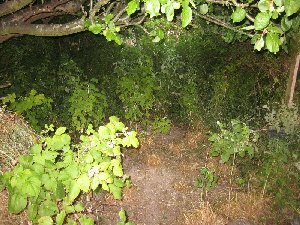 The other side of the thicket that is the redcurrant bush and Spartan apple tree is now much clearer. From the bed side, it looks like a cave with raspberries in, but at least it’s not full of weeds any more. I am going to put fabric down in there once completely clear, so that it stays clear and I may even put a small storage box there that will double up as a seat. Maybe. Found a few raspberries to eat: oddly, they are from old canes on the autumn raspberries because I never pruned them! The summer canes are still catching up with the late spring and are growing lots of berries, but they’re all still very green. I suspect that as soon as they do go red, the blackbirds will swoop so I’m glad I found some netting under the comfrey! Meanwhile! The rest of the plot continues to grow apace. Lots of pictures of the current state. Clockwise from top left: Purple sprouting broccoli, monster sage bush (and bee magnet – great for the runner beans), beetroot, shallots, onions (getting bigger), today’s harvest: courgettes and gooseberries. The hottest day of the year, and it certainly felt like it! Gave up on getting to allotment first thing to water, and decided to go up in the evening as well (which also coincided with the Allotments’ Group Cheese and Wine evening). I almost baulked though, as there were over 50 people there! 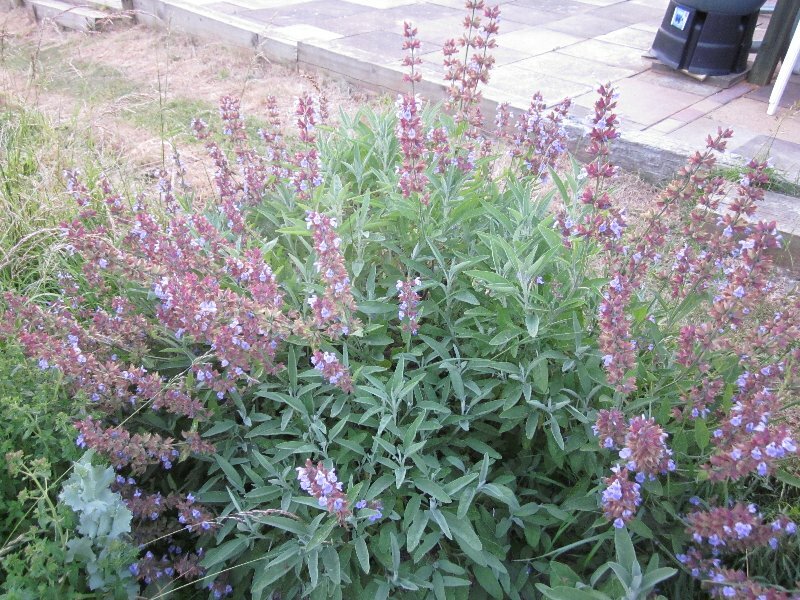 Concentrated on watering to begin with – so very dry – and then found a plate and had some crisps and nibbles. Felt quite embarrassed to be leaving a bought contribution in return! It almost cooled down to acceptable temperatures by 9pm. Onions getting bigger by the day. There are going to be some monsters about the plots come September. I’ll just settle for normal-sized onions for once. 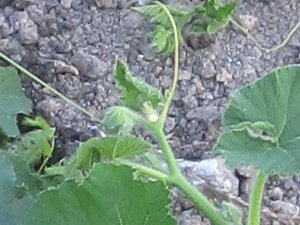 And I have a teeny weeny pea-sized little yellow female pumpkin on each plant! If they pollinate OK then these will be my attempts to grow humungous ones. Hee! Still baking hot. So much for my optimism over the itty bitty pumpkins – they’ve shrivelled! 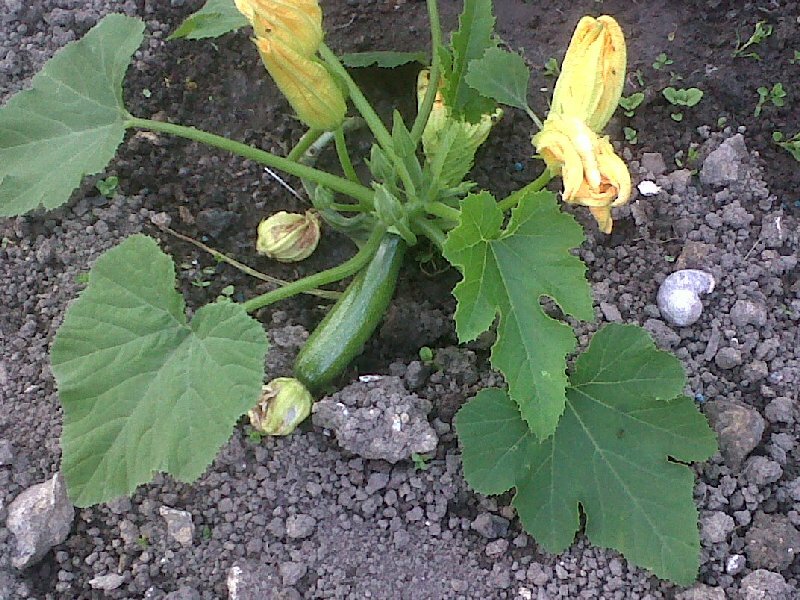 None of the cucurbits are getting to the size I would expect from a mature plant. But they’re still producing courgettes. Cut another two, though I am cutting them when they are very small to try and get the actual plant to grow! Watered everything. There are almost-ready French beans, and some runners are setting despite the weather. Normally they hate hot and dry, so I am grateful. I think the ones at home in the shade may do better. 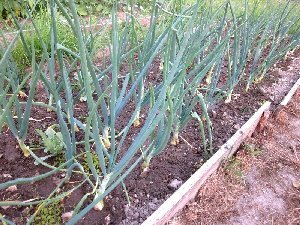 Onions still looking good. About 2” in diameter for the larger ones – I’ll settle for tennis ball-sized, which is about 2.6” in diameter. The Charlotte potatoes are dying back so I will have to take the fork up there next time I go! They have been in just over 13 weeks. Cut the first cucumber in the shed. There are at least four more going to be ready very soon… now they *do* love the heat! Wow. A cool day! Went up to water at 6.40am and also to get some soft fruit for various desserts. Came back with a few raspberries, redcurrants, the inevitable courgettes but also – bliss - first Charlotte new potatoes! 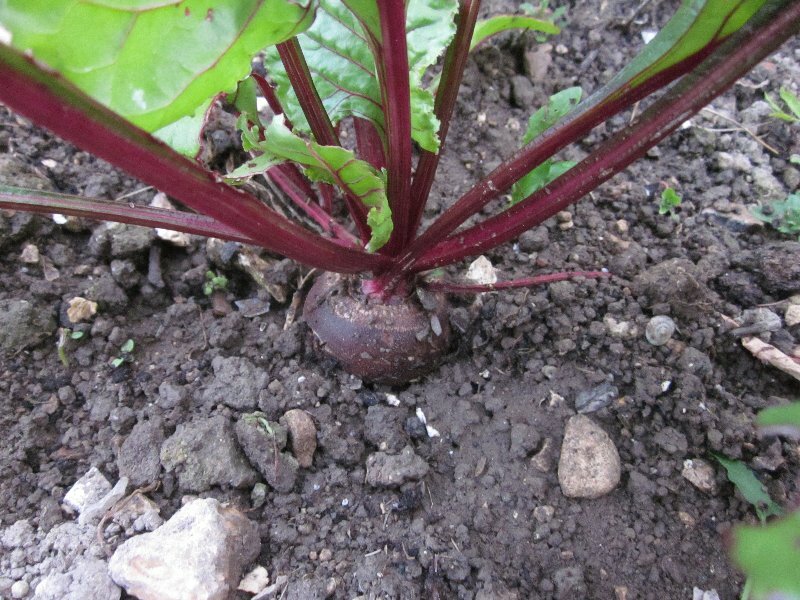 Dug one plant’s worth out of the solid earth with the hand fork and got a respectable number of smallish tubers. Steamed them rather than boiling for lunch as I was expecting them to fall but they didn’t – they were waxy and delicious. More watering, though with forecast thunderstorms we might just get a downpour. However I’m not holding my breath – we never seem to get as much rain as they forecast! Thought I could do it all in 20 minutes and didn’t take up any containers. Silly me! Three more courgettes (plants still small but getting gradually larger), quite a decent number of raspberries given old, neglected and weed-overgrown plants, and a good cropping of filet French beans. These aren’t as long as I’ve had them in previous years but no point in growing them if I’m going to let them get seedy and hard just for a bit more size. This way they’ll be tender. Froze the raspberries and beans when I got in. These ones will get saved for Christmas.